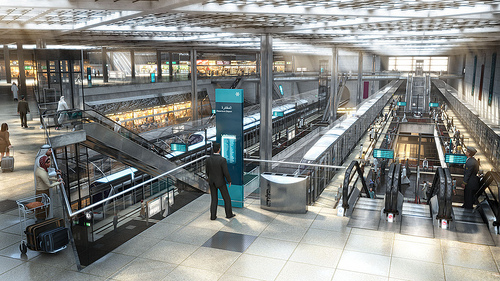 A rendering of Qatar's proposed rail system. Photo credit: Qatar Living. In light of today’s announcement that Qatar has been awarded hosting duties for the 2022 FIFA World Cup, we thought we’d take a closer look at transportation infrastructure in the small Persian Gulf country. On a personal note, I’ve always had an affinity for Qatar, because the country’s name sounds like my own when pronounced by a Bostonian. And, with all the love The Source has given to the metro system of the 2018 host city, Moscow, it’s time for some due diligence. A preliminary internet search for public transit in Qatar yielded somewhat sparse results. The small country mostly relies on a network of surface roads and highways, with private vehicles the mode of choice for getting around. It probably doesn’t hurt (or help, depending on your point of view) that gas prices are often less than a dollar a gallon. That said, the capital city, Doha, has an interurban bus system that connects it to other towns, as well as a taxi company wholly owned by the Qatari Royal Family. But a rail network is on the way. The Qatar government has entered into a contract with Deutsche Bahn, a German rail company, to build an underground rail system in Doha with four lines and 98 stations. Added to that is a high speed rail link to neighboring Bahrain, bringing the total price tag to $25 billion. The ruler of Qatar, Emir Hamad bin Khalifa al Thani wants to get his people riding bicycles. One of the challenges in accomplishing this goal is the fact that, for much of the year, Qatar is hotter than a blast furnace. Fortunately, when you’ve got a pannier full of oil money, 115 degree daytime temperatures are no big deal. 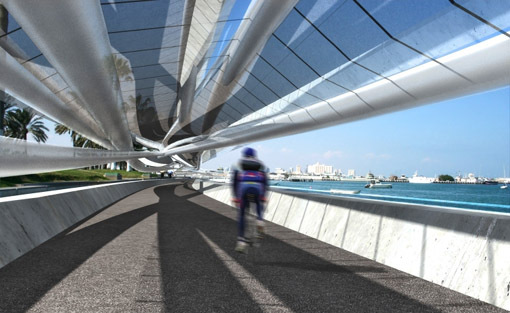 The Emir hired the Rand Corporation and Rand proposed a 30 kilometer shaded, solar-powered, mist-cooled bike path. The Emir gave the green light and with no cumbersome democratic processes to get in the way the project sailed through to approval (Qatar is similar to Brooklyn like that).